While we do not often think about how much water we use when we turn on our lights, use our hair dryer, or turn on our computers, water is essential for the energy that we consume every day. Specifically, water is used for extraction and refinement of primary energy sources (e.g. 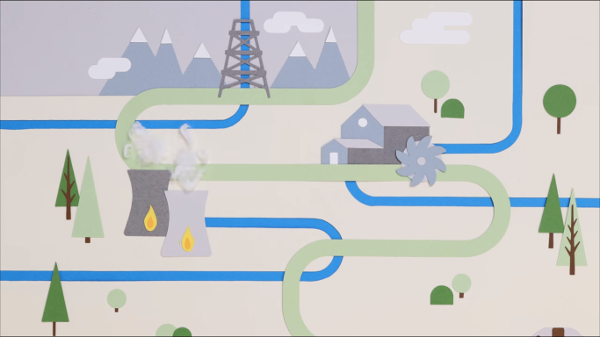 natural gas), and in many different forms of electricity generation5. The energy sector is the second largest user of water in the province, behind food production, and accounts for about 25% of total water withdrawals in Alberta2. Depending on the operation, a large percentage of the water withdrawn is either reused or returned to the environment. This presentation offers more information on our water resources. Despite this, energy demand can be expected to increase as the population and economy grow over time, placing more pressure on our shared water supply. Fortunately, there are options for individuals, industry, and government to reduce energy and water use (see below for examples). How is water used in the energy sector? The majority of water in the energy sector is withdrawn for cooling in thermoelectric generation. This is the main method of power generation in Alberta, accounting for approximately 85% of generating capacity1. Thermoelectric plants generate electricity by boiling water to produce steam, which spins a generator to create an electrical current. Such plants include ones that burn coal and biomass, and some natural gas plants. After the steam has passed through the turbine, water is used again to cool the steam (condense) back to its liquid phase7. Cooling is not required in forms of power generation that do not burn fuel to create steam, such as wind and solar. Hydroelectric generation is also dependent on water flows, but this form of electricity generation consumes essentially no water. Plants have historically used two methods to condense steam for electricity generation. The older systems are once-through, where cooling water is withdrawn from surface water, gets passed through a plant a single time and is then returned to the same or different body of water. Newer power plants reuse water and are known as recirculating systems. In recirculating systems, water is kept in closed-loop piping so it can be used repeatedly. Once-through systems withdraw more water than recirculating systems, but essentially all the water is treated and returned to the source. Recirculating systems, by contrast, withdraw less water, but more water is consumed when it is lost through evaporation due to the cooling process. Water for power generation is generally taken from surface water in Alberta, including lakes, rivers, and ponds, but generally depends on the size and location of the operation. There is little reliance on groundwater sources2. How can water use be minimized in the energy sector? Investing in alternative or renewable technologies such as wind, hydroelectric, and solar, is one way to reduce water use for energy production. Unlike thermoelectric power plants, these energy technologies tend to have fewer impacts on water, as they withdraw and consume very little, if any, water after construction. As such, these technologies may be desirable to reduce the strain on water supplies resulting from a growing population and increased demand for water from people and food sectors. It is important to remember that each technology has its pros and cons, in terms of cost of start-up, use of available space, and environmental impact, and that one type of energy generation will not satisfy the needs of all electrical consumers. There are also several technologies that treat non-traditional water sources to allow their safe use in place of fresh water for cooling or other uses8. Non-traditional water sources include oil and gas produced waters, saline aquifers, brackish groundwater, brines, seawater, and municipal wastewater. For saline sources, there are a number of water treatment technologies that could permit of the use of saline water in thermoelectric generation. Reducing energy consumption. Individuals can reduce their consumption of energy at home to reduce stress on water resources. A decrease in the demand for energy at home could decrease the amount of energy produced, meaning the energy sector uses less water to meet the needs of the population. For example, turning down the thermostat and wearing a sweater, turning off the lights in unoccupied rooms, and unplugging idle electronics can all conserve energy and therefore reduce the water used by the energy sector. Decreasing water use in the energy sector benefits the industry and the entire Water Nexus. Within the energy sector, decreasing water consumption can reduce costs and allow the sector to meet energy demand in times of water scarcity. When less water is consumed by the energy sector, this increases the amount of water available to all other users in the Nexus, as well as the environment. The Alberta Water Nexus simulator is an engaging tool that asks users to make decisions regarding water use in the Bow River Basin in the year 2030. Users are then able to view the impact of those decisions on our water resources. The simulator uses real-life examples from the major consumers of water in the Basin including the food and energy sectors, and people. In the energy section of the simulator, the user is prompted to make decisions about electricity production in the Bow River Basin to meet the needs of an increased population. The user can decide which sources of generation provide electricity in 2030 and how much of the demand is met by each source. Everyone and every sector in the Alberta Water Nexus shares a common water supply. This supply is limited, and quality and quantity vary on a year by year basis, making it especially important to plan in advance for how to best share the water. All the sectors in the Nexus are connected, therefore balancing water between them can be complicated. Actions in the Water Nexus also have cascading impacts into other parts of our society like the economy, our health, and even politics. These cascading impacts can be both positive or negative. For example, if the energy sector decides to install more wind turbines in rural areas because it uses less water than coal power, this provides income for landowners. Learn more about the connections in the Nexus by clicking here. 1Alberta Electric System Operator. 2012. AESO 2012 Long-term outlook. 2Alberta Water Council. 2012. Water conservation, efficiency, and productivity plan – electric power generation. 3City of Vancouver. 2012. Greenest City 2020 Action Plan. 2012. 6Natural Resources Canada. 2017. Improving energy performance in Canada. 8U.S. Department of Energy. 2014. The Water-Energy Nexus: Challenges and Opportunities.